Fits: All Meade 8 inch (20 cm) f/10 SCT versions with six screws on the secondary housing (LX90, LX200). The inner screws are for collimation. Knobs: Black plastic, 13 mm (1/2 inch) diameter. Threads: Black anodized aluminum alloy. Note 1: The factory dust cover will fit normally with Bob's Knobs installed. Note 2: Earlier Meade 8 inch (20 cm) telescopes have three screws on the secondary housing. These scopes require different knobs. Do not use knobs for the 6-screw secondary on the 3-screw secondary. The screws on these knobs are too long. Note 3: See our special instruction supplement for installing Bob's Knobs on Meade telescopes with six factory secondary screws. 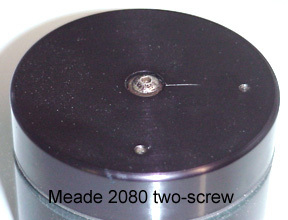 Note 4: Some very early Meade 8 inch (20 cm) model 2080 telescopes have two collimation screws. Please contact us for knobs to fit this scope.